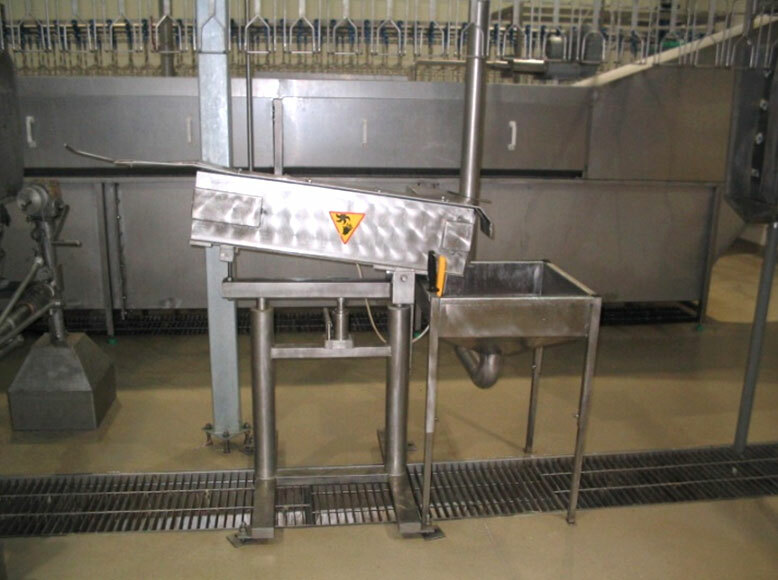 The head puller is designed for removing bird heads after their necks are cut in poultry slaughtering plants. The head puller is made of stainless, acid-resistant materials. Carcasses are delivered to the puller in shackles of the overhead conveyor. Capacity of the puller is limited by conveyor speed. The height and position of the puller is also adjusted to conveyor specifications. The head puller is a free-standing machine. For stability, it is recommended that the puller should be fixed to the floor. At customer’s request, a suspended version of the head puller, mounted to the supporting structure of the conveyor, can be made. The head puller is used for removing chicken heads after their necks are cut. It is designed for continuous operation in typical poultry slaughtering lines (it is usually placed after the picking machinery). The head puller is constructed of stainless, acid-resistant materials. The machine is equipped with its own drive unit, consisting of a gear-motor, whose specifications are adjusted to the line capacity and customer requirements. The machine design allows for angular adjustment of the pulling guides, as well as height adjustment by means of a bolt lift, which makes it possible to match the size of processed birds. 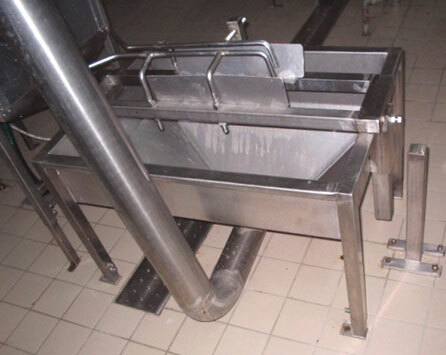 The apron conveyor with special sweepers, mounted inside the puller, ensures fast delivery of pulled heads to the reception point (containers, charging hoppers of the pneumatic transport system etc.) Speed adjustment with fitting to capacity by use of control cabin with inverter. Simple design and the materials used for its manufacture ensure durability, efficiency of operation and facilitate proper cleaning of the machine.